Steve Cockram is an international speaker, author, and consultant to top-level executives and leaders around the world. He is a subject matter expert on personality and wiring, organizational leadership, emotional intelligence, and interpersonal communication. Steve is the co-founder of GiANT Worldwide, a global leadership consultancy. He is fiercely practical and committed to “Applied Leadership Learning”, seeking to give leaders fresh insights and tools that will make a real difference immediately. Steve is also co-author of the books 5 Gears and 5 Voices published by Wiley. Brad Smith started the call by introducing this highly-accomplished, and very humble, Steve Cockram. His expertise, the understanding of Leadership voices and how to lead people in the "digital age" vs. the "industrial age". Steve, having traveled and worked with Leaders around the world has learned first-hand what leadership is in the digital age. People have to understand the differences between the former industrial age and ways of leadership, and the digital age of leadership. Every 250-300 years there are technology breakthroughs that change the way we work. Steve, and his team set out to determine what common challenges could be found across multiple sectors, cultures, and companies. They uncovered 5 challenges, that if put into order of relevance, with the right set of tools, can create a roadmap through the new world of business. How do I lead in a world that never turns off? We are expected to always be "on". If you try to live in the 9-5 industrial age and the digital age, this causes huge amounts of burn-out. Emotional and physical breakdown of brilliant leaders. The old world had positional power. It was established over time with hard work, and moving up through leadership ranks. The new world has a brand new currency, influence. Now leaders must ask the question, how do I lead through influence not power. The world of communication and learning has changed. The day of words and information has turned to visual, interactive world. We are transmitting more than ever, but never less effective communication. By having long discussions, and long emails, you may think you are communicating, but if its not interactive and visual, most people have tuned-out. It must be interactive, and able to apply it quickly. How do we lead by agile collaborative teams vs recruiting high-talent in a competitive environment? The new world, culture is the most important change to the work. How do I connect with a team that is digitally connected but geographically separated? Matt and Brad Smith use the GiANT leadership training and understand the importance of the toolkit. Its a way of systematically framing the systems and culture of your business. If you dont know what success is, its very difficult to multiply. "You must decide what the culture is going to be and actually have it clearly defined", said Cockram. The Millenial generation wants to work for people they believe in, work for a cause, leaders that will invest in them. 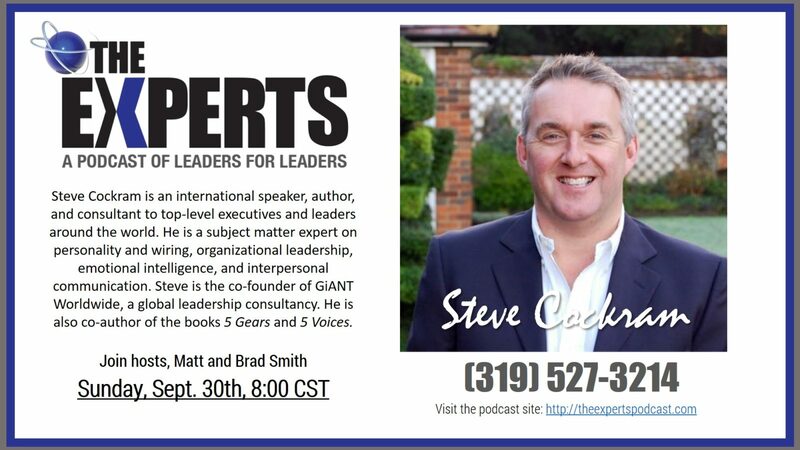 This is where Matt brings in the 5 voices and how Steve, along with Jeremy Kubicheck, created a roadmap for understanding the voices associated with each person and how to best structure your leadership around the idea that people are made up of 5 different voices. The top voices being your dominate, the bottom voices are usually learned and not the ones a person naturally communicates, and often times will have difficulty understanding. The motivation behind the study started with Steve being given a gift of the Myers-Briggs studies. This was a huge awakening to realize what it was like to be on the other side and the importance of keeping it simple enough for an educated 13-year-old. The 5 voices is a simplification of the fundamentals that anyone can teach. In the average team, 60% in terms of culture, and 82% feel they arent heard and bring their best every day. The 5 voices are vast and reading the book is the only way to truly apply the understanding of each voice and how they interact together. Steve gave a fantastic overview of each voice and offered extended resources on the GiANT website. Every voice has the capacity to lead, but statistically, there are more of some voices in management than others, not due to ability, but due to not knowing better. Any team that doesn't have one of the voices represented will always fall short, and one voice will have to serve in a role that is not their strongest. Each voice has its power and grace and brings harmony to the team. Nurture- the champion of relationships, values, team players, loyal, oil in the wheels of the team. They have a six-sense for people and the ability to help others to engage in change. They account for trust, values, and judge people more accurate than others. 43% population has the Nurture voice as their foundational voice, and 70% of those are female. They have the ability to read people at a visceral level. This voice is the least heard and the least valued. They have a tendency to believe negative about themselves and have doubts about their value. They are humble leaders that are filled with compassion. Creative- only 9% of the population, they are champion of ideas, innovation, and organization. They see the future and often the threats coming up. They think outside the box by solving problems that others can't. The challenge for the creative voice is they communicate an idea but they aren't heard effectively. They need the freedom to be wrong at times. Creatives only speak when they have something to contribute but will often need clarifying questions to find out the true idea. Integrity is a huge part of the creative. Are we making a difference in the world? Guardian- the champions of due diligence, truth, healthy systems, processes and the ability to bring order to the world. They ask amazing questions with strong detail. They are the custodians of the money and resources. Amazing ability to follow through on projects and always stick by their word. The guardian fears most not being a person of their word. Connectors- Full of life, full of ideas, they love to tell stories and have a great impact on the world around them. They are the life of the party and love the ability to integrate all areas of life. The connector is brilliant at messaging and connecting people to opportunities. The connector usually resembles a salesman, but it's not about sales for them, it's about the relationships they form. The connector struggles with being defensive because they love people and want to have collaboration. Pioneer- Over-represented in corporate America. They love the ability to align people, resources, and strategic challenges. They win at all costs and are driven to work. The mature Pioneer they realize no one doubts them, and have the ability to champion others. Nurture first- You must be careful with the critique because the nurture takes everything personally. Creatives- Its ok to be wrong sometimes. Guardian- They slow things down and ask the right questions. Connectors- tell the stories. Usually talk longer than others, but connect with the heart. The connector voice should spend half of their time outside of the business not in the business. Pioneer- Always goes last because they can bring strong ideas that may overpower others. 7% of the population but the majority are in leadership positions. The desire to compete and win pushes them to the front. What is your voice order? Are you in a healthy team? Are all the voices represented? You can drive performance but must have a healthy culture to win over time. How you build relationships inside and outside your organization is the key to how you will succeed in the new world of Business. Brad Smith wanted more information on what is known as the "kryptonite" of the different voices. What are the blind-spots for each voice. Steve right away suggested the new GiANT TV coming in November. The program will dive deeper into each voice and how they best take on and give off information. Pioneer- have issues when skills break down under pressure. Pioneers will default to task-focused and ruthless, driven, and very intolerant of incompetence. Arrogance in the Pioneer will kick in and make decisions that will isolate teams. Its difficult for the pioneer to take the blame. You have to know yourself to lead yourself. Most pioneers undermine they influence by becoming harsh and judgmental. They compromise culture because they will trade performance for values under pressure. At Symmetry Financial Group, we have a strong focus on personal development and being a better person. Steve was asked how all of this has spilled over into his own life. He felt almost all of the work was done on a personal level. Transforming the core then moves out to the family and to the team. The impact always goes out and to define your culture, you must start from the personal growth. Enjoy Steve and Jeremy's Podcast, on how to liberate each of the voices. Click here to listen to TEDx talk from Steve. ← Donald Kelly- What are 3 mistakes holding new and struggling sellers from closing more deals?